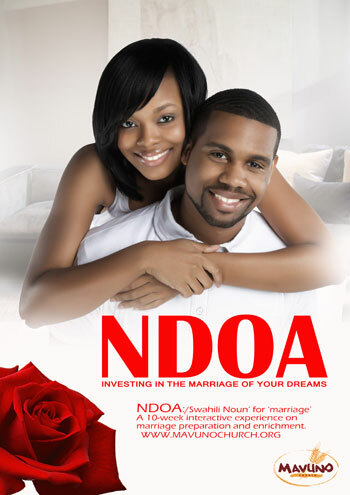 NDOA is a Swahili word for marriage. Mavuno Church highly esteems marriage. We believe marriage is a precious gift from God and it is for life. Therefore, it must not be taken lightly or carelessly, but responsibly and after serious thought and preparation. The 10-week marriage preparation/enrichment experience (NDOA) is one major avenue to assist couples in their preparation. Mavuno Church policy for marriage requires that for the church to conduct a wedding, the couple must first go through the NDOA experience and be duly cleared to be married by the church. There are some incidences where the Mavuno Church will not be at liberty to conduct a marriage. NDOA is a ten week experience designed to enable both engaged and married couples discover and work through issues they had not considered previously and establish sound values for marriage. NDOA also gets you into a support group of people at the same season in life, working towards the same goal of building stronger families. The groups share ideas, receive support and deal with common challenges of preparing or living out a fulfilling marriage. NDOA classed are run three times a year for a period of 10 weeks each with classes commencing in January, May and September in most of Mavuno’s church campuses. Ndoa classes are divided into two groups at whichever venue they are held in. We have ENRICH CLASS for couples who are already married or co-habiting and QUEST CLASS for couples that are dating, courting or those planning to get married. The classes cost 15,000 per couple and participating couples are expected to attend the 10 classes including a half day mid-season event, two movie nights, a hen and stag party and the end season event. Eighty percent attendance is required for one to have successfully completed the NDOA experience. A graduation event is held at the end of a NDOA season during the church service.